Publisher: Reprint edition, published by Genealogical Publishing Co., Inc., Baltimore, Maryland, 1985. 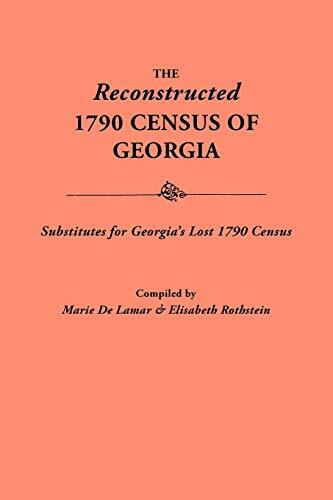 The compilers of this work extracted data found in wills, deeds, tax digests, court minutes, voters' lists, newspapers, and other contemporary records--records roughly contemporaneous with the 1790 census--and they have identified about 15,000 Georgians who were living at the time of the 1790 census, thus creating a "reconstructed" census from substitute records. Counties covered include all of those formed before 1790, i.e. Burke, Camden, Chatham, Effingham, Franklin, Glynn, Greene, Liberty, Richmond, Washington, and Wilkes. Also covered are Columbia and Elbert counties, which were formed just after the census was taken. Information in the text is purposely sparse, the compilers' object being simply to identify individuals in at least one record of a county at a particular time. When the original edition of this work was published in 1976, it had no index. Our reprint contains a complete name index with thousands of multiple references.